For [wineness?] or belking in ye stomack 10 Take of ye conserve of mints half an ounce orange peel prefered an ounce coriander seed a scruple syrup of Succory with rhubarb half an ounce, mix it according to Art, take ye quantity of a wall nut every day att seven a Clock in ye morning for totnes in ye stomack take a plaster of bay berries Zi and apply to ye stomack. 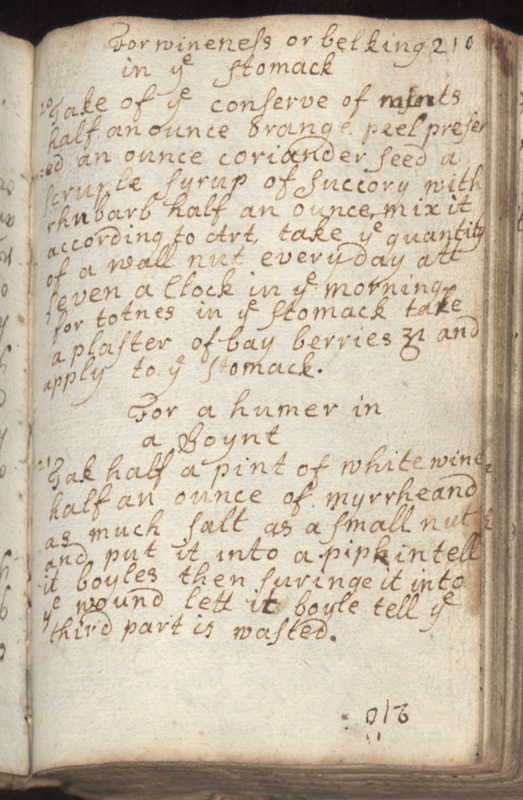 For a humer in a Joynt 21 Tak half a pint of white wine half an ounce of myrrh and as much salt as a small nut and put it into a pip intell it boyles then suringe it into ye wound lett it boyle tell ye third part is wasted.